I found this piece of fabric on one of my oppie trawls recently and I couldn't leave it there cause.....well, I dunno really......I just couldn't! I don't know if it's vintage or new, but if it's vintage then it's in absolutely new condition! 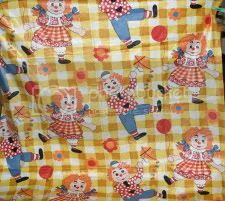 But now that I own this piece of raggedy anne and andy fabric I don't know what to do with it as the dollies are HUGE. Like each one must be 30 cm's high! My problem with that is that I hate cutting off the limbs or heads of the dollies.....but having said that it would make a very cute quilt top, but I really don't want to cut out the dollies and piece the top. Hmmm, am I the only one who thinks these things? I LOVE LOVE LOVE this fabric!! You know I think it would look super cute made into little pinni dresses. Ones that can be worn on their own or with a skivvy & tights underneath.